Totally surprising the world, Pope Benedict XVI announced his resignation at the end of February after nearly eight years in office. Many observers de­bate the wisdom and timing of his notice, considering that the last resignation from the papacy occurred nearly 600 years ago. Others expressed the opinion that the Pope should have delayed his pronouncement until the season of Lent passed. However, South Los Angeles Catholics were accepting of Pope Benedict’s action with some even commending his acknowledgment of the heavy impact of declining health and advanced age. “One thing I’ve noticed is that most Catholics applaud his decision and agree it was a wise choice. 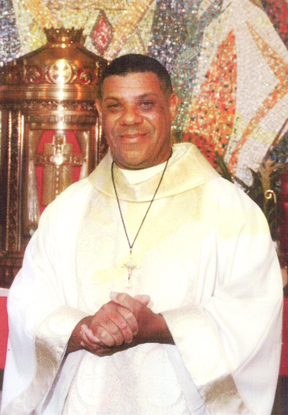 He acknowledged the limitations of his age and accepted ending his service after eight years,” noted Father Paul Spellman, pastor of Holy Name of Jesus Catholic Church. Holy Name, located at 1955 West Jefferson Boulevard, ministers to a congregation that is 80% of African descent comprising natives of the U.S., Africa, the Caribbean, and Central, South and Latin America. The leaders of Transfiguration Catholic Church, an enduring institution in the Leimert Park neighborhood, shared similar reflections. “The deacons at the Deacon Mission Center, Inc., included Pope Benedict XVI in our evening prayers. We prayed for health of our Pope and that the Holy Spirit will lead our church in this time. We are sure the Holy Spirit will continue to guide the church in the direction that God wants the church to go,” said Deacon Greg Patterson. “Pope Benedict is a humble man. It took a lot of courage to step down, considering his health and not being able to do as much travel as he needs to do,” observed Margret Henschel, wife of Deacon Louis Henschel. Los Angeles Archbishop José H. Gomez described Pope Benedict’s resignation as “a beautiful, Christ-like act of humility and love for the Church. This is the act of a saint, who thinks not about himself but only about the will of God and the good of God’s people. Cardinal Roger M. Mahony issued a statement saying, “Pope Benedict XVI has been an extraordinary successor to St. Peter these past eight years, and I thank God for the graces and blessings which have come to the Church and to the world during his Pontificate. Vatican officials announced that a Papal Conclave, comprised of the College of Cardinals, will convene before Easter Sunday to select Pope Benedict’s successor.